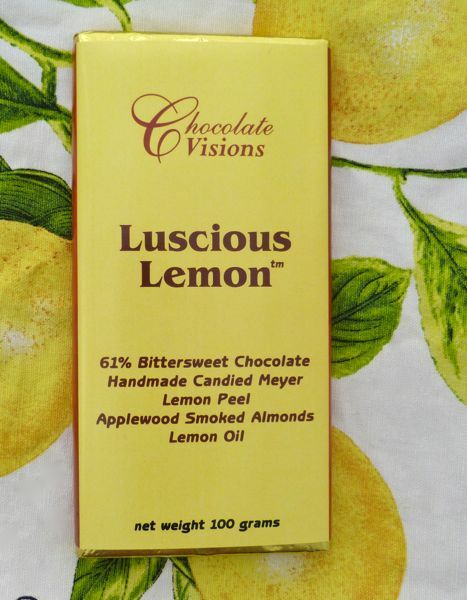 Today's "Luscious Lemon" bar from Chocolate Visions (Scotts Valley, CA) was made with a 61% bittersweet chocolate base. The chocolate itself was good, albeit a bit flat. The flavor additions were the main attraction. They included a well executed blend of handmade candied Meyer Lemon peel, Applewood smoked almonds, and lemon oil. 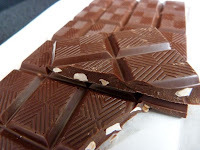 I also enjoyed a piece of this bar with a few grains of smoked salt on the side. 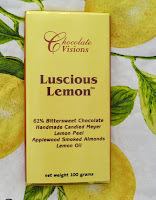 Today was Day #5 of Chocolate and Lemon Theme Week.